attachment="screenshot.gif" attr="h" comment="" date="1274067851" name="screenshot.gif" path="screenshot.gif" size="8912" user="TWikiContributor" version="1"
attachment="screenshot-small.png" attr="h" comment="" date="1291363747" name="screenshot-small.png" path="screenshot-small.png" size="22317" user="TWikiContributor" version="1"
attachment="screenshot.png" attr="h" comment="" date="1291364339" name="screenshot.png" path="screenshot.png" size="20920" user="TWikiContributor" version="1"
< This module packages the Mishoo JSCalendar, a DHTML pop-up calendar in a form suitable for use in TWiki forms and TWiki applications. Set SHORTDESCRIPTION = Mishoo JSCalendar, packaged for use by plugins, skins and add-ons. < Another great TWiki extension from the WikiRing - working together to improve your wiki experience! < The first parameter to showCalendar is the id of the textfield, and the second parameter is the . See the Mishoo documentation for details of the '$e %B %Y' parameter. > The first parameter to showCalendar is the id of the textfield, and the second parameter is the date format. Default format is '%e %B %Y'. < Mishoo JSCalendar, packaged for use by plugins, skins and add-ons. > You do not need to install anything in the browser to use this extension. The following instructions are for the administrator who installs the extension on the server where TWiki is running. > Like many other TWiki extensions, this module is shipped with a fully automatic installer script written using the BuildContrib. > Another great TWiki extension from the WikiRing - working together to improve your wiki experience! 10247 Item2054 put the calendar at z-index 2000, way above pattern skin divs. 6634 Item453 removed EditTablePlugins private copy of the Mishoo JS calendar, and made sure it works with JSCalendarContrib. Improved the documentation of the JSCalendar while I was there. Read the Mishoo documentation or visit the demo page. > This package provides a renderFormFieldForEditHandler that could be invoked by a plugin to ensure that forms use the Mishoo JSCalendar for editing. addHEAD can be called from commonTagsHandler for adding the header to all pages, or to beforeEditHandler just for edit pages etc. you make will simply be overwritten the next time a release is generated. Instead, you could check your fix in, raise a bug in the Bugs web, or mail thge author. > Mishoo JSCalendar, packaged for use by plugins, skins and add-ons. 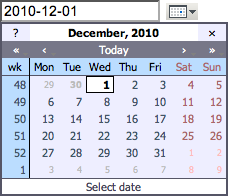 The first parameter to showCalendar is the id of the textfield. See the Mishoo documentation for details of the '$e %B %Y' parameter. Note that the header will only be added once, regardless of the number of times that addHEAD is called.